It's 11pm. Her stunt is called. She piles into the back seat and they take off. The car roars away and hits top speed in no time, Driven by a "masked killer," it speeds and swerves down the dimly lit street, crashing and bashing as the car darts along. Two hours and many takes later, she comes off the set, looking worn but also a bit board. More accustomed to the heady adrenaline of knife fights and high falls, she feels...underutilized. Smoothing her wig and preparing for her next series of takes, she looks to us and deadpans, "I would rather have been on the hood." Meet Kelsee king-Devoreaux, one of Hollywood's hottest and most resilient Stuntwomen. Since the late 80's, Kelsee has been following her dream...and making it happen every day. Always the consummate professional, .Kelsee has been without equal, doubling dozens of the hottest celebrities and performing hundreds of grueling, nail biting stunts. Not only a professional stuntwoman, Kelsee king-Devoreaux is an accomplished Author. 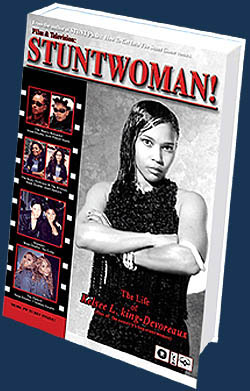 Her recent book, "Film & Television: STUNTWOMAN!" is in wide release and doing very well from coast to coast. Kelsee has lead the way in the Stunt industry for not only African American women, but for all women that wish to let down their hair and follow a similar dream. The size of, and respect given to, the female stunt community has almost tripled since the 70's, largely due to women such as Kelsee king-Devoreaux. A proud member of the Stuntwomen's Association and the Stuntwomen's Foundation, Kelsee is the first African American woman in history to be accepted as a member of the Academy of Television Arts & Sciences. Featured in numerous Television programs and Periodicals, Kelsee has been a solid, respected representative of the Stunt Community and continually strives to not only better herself, but provide opportunity and training to fledgling Stuntwomen. Currently, Kelsee is coordinating stunts and Co-Producing an in-depth Documentary about the history of African American Stuntwomen, along with other documentaries, such as the highly anticipated: "Top Ten African-American Stuntmen." 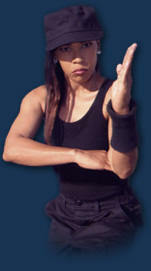 Kelsee king-Devoreaux...Stuntwoman, Author, Producer, God's. A force to be reckoned with.